Following the success of his first New York show at Hollis Taggart Galleries in 2011, sculptor Pablo Atchugarry returns with 19 pieces that demonstrate his strong technical skills and devotion to his craft. 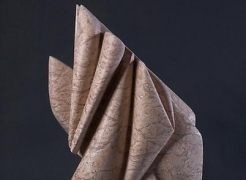 Atchugarry recognizes the hardships of direct carving—physical effort, precision, patience—but by living in stone, he creates works that are both graceful and commanding. Atchugarry’s workshop is located in Lecco, Italy, where he is close to the material he uses for his sculpture. One appropriately titled piece Life in Stone (2013) demonstrates Atchugarry’s ability to defy the massive weight of the Carrara marble to create a soaring and elegant work reaching toward the sky. A smaller-scale piece of Pink Portugese depicts deep, thick accordion folds of pure movement. Although abstract in nature, Atchugarry’s sculptures are evocative of human-like forms, breaking waves, and still lifes. Atchugarry is a direct carver who eschews the system of having others execute a work for him. The artist is the one seen drawing on and chiseling the block, and he alone breathes life into his pieces. The selection of bronzes included in this exhibition is the largest number shown in the United States to date. In addition to the black bronzes Atchugarry is known for, there are also some with patinas of steely blue and verdigris. This new body of work reveals another layer of complexity through the use of color. The artist has long been recognized in Europe as a leading sculptor; his public commissions are located throughout Europe, South America, and the United States, and his work is held in private collections around the world. In 1999, the Pablo Atchugarry Museum was inaugurated in Lecco. His foundation, opened in Punta del Este, Uruguay, in 2007, is a museum, gallery, and sculpture park. The exhibition is accompanied by a fully-illustrated catalogue featuring an essay by Eric Bryant, a New York-based critic and journalist. He has written about contemporary art and artists for more than 20 years and contributed to Art & Auction and ARTnews.